Try one of the videos for free! Can you find the best move? Press Forward to play the next move. Ronen illustrates another basic idea in the tactics realm: the discover attack. As he says, when there is an open file, and a piece - or the Queen - is potentially under attack, it's like when you see a red dot hoovering over your chest. Nobody has pulled the trigger yet, but you need to pay attention! Attacking a piece by a discover check leads to win material, and often the game. 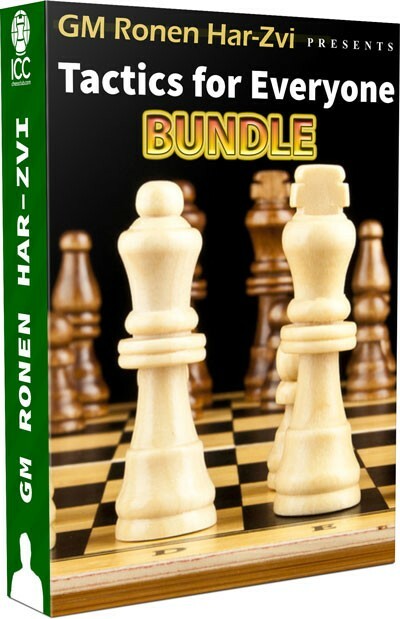 Again, it's important to recognize the patterns which lead to these advantageous situations, and once you get familiar with the patterns, you can find ways to create positions on the boards which will help you use the tactics Ronen is teaching you in this amazing show. The pin is one of the most powerful weapons we can use over the board. Ronen classifies the pins into three different categories: absolute pin, relavite pin and pin on a square. In this episode of his Tactics for Everyone show, Indiana-Jones shows us how to use this important resource, which can really be decisive during a game. The Board has got 64 Squares! You see a nice move, a move that's very tempting. Well, you have two possibilities: 1) Play the move quickly, bang on the clock and run jumping around, like you had just scored a goal in Barcelona vs. Real Madrid; 2) THINK. Yes, think carefully about what you're going to move, what your opponent will reply, and the consequences of your "brilliant move". It is a matter of changing one's approach to the board: we often see good moves in the short range, forgetting that the board is quite large, with 64 squares full of tricks and possibilities. As Ronen says, the great World Champion Emanuel Lasker said one of the most important - and famous - truths in chess history: when you see a good move, look for a better one! "I have only two words: Game 6!" - Ronen refers to the recently concluded World Championship Match between Magnus Carlsen and Vishy Anand. In game 6, neither of the two incredibly strong opponents saw what the other was threatening over the board. In this interesting episode of his Tactics for Everyone series, Ronen shows us how important it is to understand what your opponent threatens before you make your next move. It might sound like a very simple concept, that every chess player already knows... but it's not exactly as you may think. Watch the video and let Ronen guide you through this important topic. The enemy's King hasn't castled yet. Good! Let's keep it stuck in the center of the board, and then... attack! In this video, GM Ronen "Indiana-Jones" Har-Zvi makes us aware of the importance of castling. When the King is stuck in center, there are tactics patterns that can lead to immediate victory or, in some cases, to an overwhelming material advantage. The key-words, in this particular case, are "open files". Rooks, Bishops and, of course, the Queen, work together on open files to threaten the King that cannot castle. Don't miss this brilliant tactics lesson! We see tactics as a weapon to attack, win material, destroy our enemy's formation. But what about being able to use tactics to defend? You know, when you are on the brink of defeat, your opponent has mate in one, the position looks totally lost. Well, that's the exact moment to check for tactics! Forcing moves, sacrifices and everything we have learned with Ronen so far can become an important resource to pull ourselves out of trouble. In this very interesting video, GM Ronen Har-Zvi uses some advanced tactics to illustrate how an apparent defeat can be overthrown by using the powerful "tricks" of tactics. Many times we find ourselves analyzing a position on the board and thinking, it's draw, I can't find anything that would give me an advantage here. Well, sometimes there is a little and "hidden" move that can turn the table. It's the famous intermediate move, an in-between move that can make the difference. With these two videos on this important part of tactics GM Ronen introduces us into the almost-magic world of the intermediate moves. What's the most beautiful, stylish and, why not, romantic way to win a chess game? Yes, you're right: sacrificing the Queen to checkmate the enemy King! In this new espisode of his Tactics for Everyone! show, GM Ronen Har-Zvi guides us through this amazing piece of theory in the tactics department. As usual, it's a matter of patterns; when we learn to recognize the patterns, everything seems to fit perfectly over the board. By showing puzzles from famous games and problems he created, Ronen teaches us how to spot the patterns and, with the supreme and elegant sacrifice, win the game.